I think most Oregon Duck football fans — this one included — would love to see a clear leader emerge this spring from the pack of contestants vying to replace Marcus Mariota as Oregon’s starting quarterback in 2015. 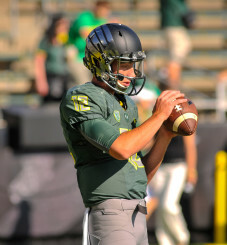 That leader would then be pitted against incoming transfer Vernon Adams in a clear two-man race to be the Ducks’ 2015 field general. While a leader among Jeff Lockie, Morgan Mahalak, Travis Jonsen, Taylor Alie, and Ty Griffin may in fact be emerging behind the gated, padlocked, and laser-alarmed doors of the Moshofsky Center, Oregon’s coaches are far too wise to make such information public to the players or the media. And as much as I would personally love to see a clear pecking order going into fall camp, I think the staff is completely correct in playing this competition close to the vest. 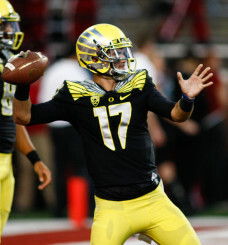 Jeff Lockie has the most experience of any returning Oregon Duck QB. Every football team has a clear vertical leadership structure. Decisions flow from the head coach, to the assistant coaches, down to the support staff and players. What makes Oregon unique, however, is the way in which both Chip Kelly and now Mark Helfrich have fostered a culture of horizontal leadership within the lower ranks; specifically, among the players. Kelly first introduced this by naming squad leaders, rather than a select few permanent captains. This allowed a much larger percentage of the team to assume formal leadership roles. The trickle-down effect of having more formal leaders within an organization is that even more individuals feel empowered to take on a leadership role; be it large or small. Ultimately, this leads to a horizontal leadership structure where players police themselves, rather than being policed by an outside authority figure (i.e., the head coach). This model of horizontal leadership among players is essential for the sustained, long-term success of a football program, because the head coach is not around to police the players all year long. Taylor Alie is in the mix for the open quarterback job in 2015. Using Helfrich’s comments as a guide, let’s play this out. 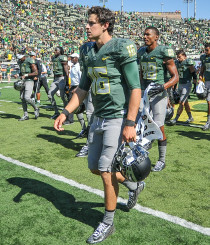 If Oregon anoints Lockie as the front-runner out of spring ball, naturally he will assume a leadership position through summer workouts, at the expense of the other candidates, who are now aware of their place in the pecking order. If Adams comes in and wrenches the job from Lockie, it will disrupt all of the social capital Lockie built with his teammates throughout the summer. This, in turn, will make it harder for the team to buy into Adams as the starter. Oregon’s coaches are smart, and they played football. They are very aware of the locker room dynamic. By not anointing or even hinting at a leader in the quarterback race, each contestant stays hungry, and each takes more of an active leadership role heading into fall camp. This also gives Adams a better shot to win the job when he finally arrives, as the team has not yet rallied around any one player. This approach fits Oregon’s player-based horizontal leadership model. Former players such as Nate Costa and Ayele Ford, both career backups, were considered highly-respected leaders in the Ducks’ locker room. This does not happen within a strictly vertical leadership structure, where only the star players assume leadership roles. 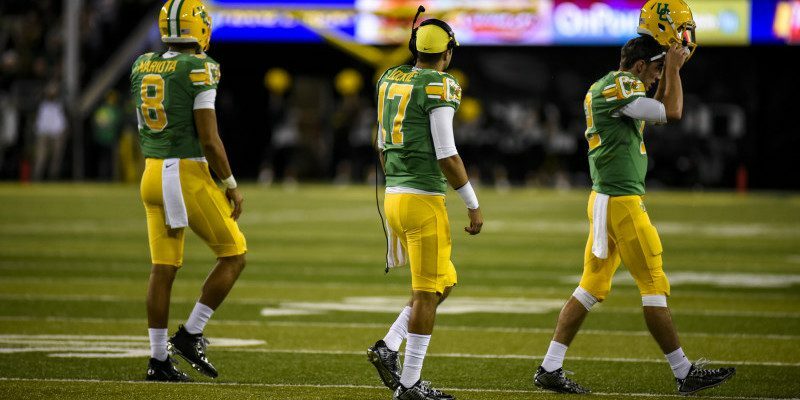 By allowing several players who will ultimately be backups in 2015 to earn the respect and trust of their teammates now, the Ducks reinforce their internal culture, where even a backup can speak his mind or call out a teammate. Why does this internal culture matter? When people talk about the most successful football programs, “culture” is a word usually tossed around. Remember when Urban Meyer left Florida? All everyone talked about was how the culture of that program eroded in his final seasons. The time is now for redshirt freshman Morgan Mahalak. In contrast, players who have spent time in perennially successful NFL franchises such at the Pittsburgh Steelers or New England Patriots often discuss the positive culture fostered by those organizations. On the opposite end of the spectrum are perennially dysfunctional franchises like the Miami Dolphins or Washington Redskins, where a lack of accountability and constant turnover prevent a staff and front office from building a sustainable winning culture. Oregon has, over time, built a unique — and highly successful — player-based culture. (Incidentally, this is part of the reason Oregon is frustratingly selective in recruiting, since not every player fits a horizontal leadership model.) In its most important and most high-profile position battle in program history, the Ducks’ coaching staff knows the best way to preserve this culture is to prolong a wide-open competition as long as possible. We will get an answer to the 2015 quarterback riddle, though I fully expect this answer will not come anytime soon. However, our patience will be rewarded with years of continued success in the coming years of the Helfrich era.